[PDF] Topological and Statistical Methods for Complex Data: Tackling Large-Scale, High-Dimensional, and Multivariate Data Spaces (Mathematics and Visualization) | Free eBooks Download - EBOOKEE! 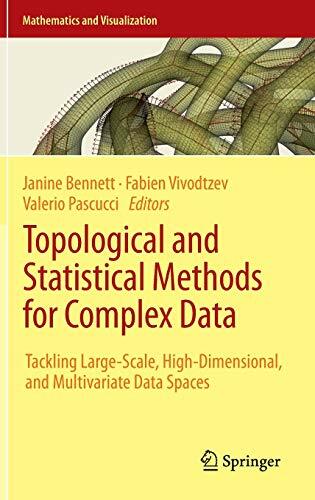 Description: This book contains papers presented at the Workshop on the Analysis of Large-scale, High-Dimensional, and Multi-Variate Data Using Topology and Statistics, held in Le Barp, France, June 2013. It features the work of some of the most prominent and recognized leaders in the field who examine challenges as well as detail solutions to the analysis of extreme scale data. The book presents new methods that leverage the mutual strengths of both topological and statistical techniques to support the management, analysis, and visualization of complex data. It covers both theory and application and provides readers with an overview of important key concepts and the latest research trends. Coverage in the book includes multi-variate and/or high-dimensional analysis techniques, feature-based statistical methods, combinatorial algorithms, scalable statistics algorithms, scalar and vector field topology, and multi-scale representations. In addition, the book details algorithms that are broadly applicable and can be used by application scientists to glean insight from a wide range of complex data sets. No comments for "[PDF] Topological and Statistical Methods for Complex Data: Tackling Large-Scale, High-Dimensional, and Multivariate Data Spaces (Mathematics and Visualization)".